SMOK Granted the World's First POD System UL8139 Certificate - SMOK® Innovation keeps changing the vaping experience! On the afternoon of January 24th, the world's first Pod System UL8139 certificate awarding ceremony and the SMOK UL strategic cooperation signing ceremony were held in the IVPS exhibition hall. Mr. Yu Xiukun, Vice President of UL Company (hereinafter referred to as "UL") and General Manager of Electronic Technology Industry Department for Asia Pacific, Ms. Grams, Global Marketing Director of Internet Technology Group, Mr. Ouyang, CEO of Shenzhen IVPS Technology Co., Ltd., Mr. Gao Xu, Vice President and R&D Director, and other relevant leaders attended the ceremony. The issuance of the world's first Pod System UL certification and the in-depth cooperation between IVPS and UL have positive implications for the entire e-cigarette industry safety standards. Mr. Ouyang reviewed the company's development history and elaborated on the company's emphasis on product safety and investment. He expressed his gratitude to UL for the communication of the first UL8139 test product. At the same time, he introduced the industry-leading WTDP laboratory that the company has invested heavily in. He also looked forward to the strategic cooperation direction with UL in the future and expressed his expectation for the safe development of the e-cigarette industry. In his speech, Mr. Yu Xiukun spoke of UL's philosophy and mission as a global leader in safety. He expressed his concern for the safety of the e-cigarette industry, introduced the birth of UL8139, and the striving direction and goal of the UL in the e-cigarette industry in the future. He also said that the cooperation with IVPS was very smooth, and believed that under the leadership of leading companies such as IVPS, UL would play a greater role in the safety of e-cigarette products. Subsequently, Mr. Yu Xiukun, presented the first Pod System UL8139 certificate to the company. It is worth noting that the certificate is not a general paper certificate, but a special metal award plate specially designed by UL, which fully demonstrates UL's emphasis on cooperation between the two parties and the “gold content” of UL certification. After the award ceremony, IVPS and UL strategic cooperation signing ceremony was held. Mr. Ouyang and Mr. Yu Xiaolong, Sales Director of UL Electronics Technology Industry for China, signed the strategic cooperation agreement on behalf of IVPS and UL respectively, and announced the official opening of strategic cooperation between the two parties. Mr. Gao Xu introduced the strategic cooperation direction of the two parties. First, we will expand the certified product category and cover all the main products of SMOK. Secondly, the WTDP laboratory jointly built by the two parties will greatly shorten the product testing time and improve the company's research and development strength. Finally, as a leading company in the industry, IVPS will jointly participate in the discussion and planning of e-cigarette related standards and promote the improvement of industry standards. Mr. Yu Xiaolong introduced the safety features of e-cigarette products and the contents of the UL8139 standard, and he is looking forward to the future cooperation with IVPS. At the end of the event, the executives of both parties visited the IVPS Company and the WTDP Lab. The laboratory has been finished the test and put into use. The laboratory tests include short circuit, drop, waterproof, temperature rise, extrusion and other projects, all built in accordance with UL8139 standards. The use of the laboratory makes IVPS product testing more convenient and the certification process significantly shorter, furthermore, it enhances the brand awareness and core competitiveness. 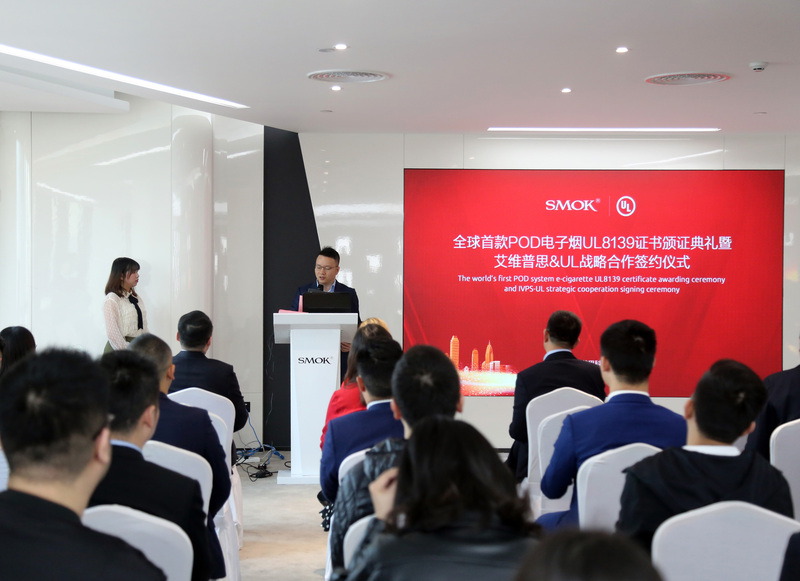 The awarding and signing ceremony is an important milestone for SMOK in product safety construction. In the future, SMOK will strictly implement the concept of “safety throughout the product life cycle”, pursue safer and higher quality products, and provide comfortable and secure e-cigarette experiences to consumers around the world.